Amidst all the excitement over Alonso's return to Renault and speculation regarding Kovalainen's dwindling options as a result, a little item regarding the threat to Super Aguri's existence caught my eye. 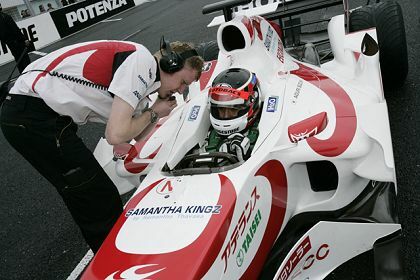 After a season in which the little Japanese team became everyone's favorite, it is sad indeed that it may not make the grid in 2008. Although Super Aguri drew similar emotions from us to those once elicited by Minardi, the teams were very different apart from their plucky underdog status. Minardi were the great survivors, hanging on to F1 by their fingernails and through sheer Italian passion for racing; SA attained their status more through beating their parent team than anything else. It was not that long ago that the Honda 'B' team was a figure of fun, running an outdated Arrows chassis and struggling to keep up with the rest. The greatest surprise was that they managed to close the gap and scored a point in the last race of 2006. Their better form this year was not entirely unexpected, running a proven Honda chassis as they were - but that they should beat the factory team's awful car was so ironic that we began to urge them on to greater achievements. Their fading towards the end of the season was the inevitable result of money problems. Now it seems that Honda may not fund their 'B' team any longer. The desertion of SA's main sponsor mid-season meant that the parent company had to shoulder the bulk of the burden of keeping SA going and this, coupled perhaps with the embarrassment of Honda's performance relative to their junior team, has meant that the board must discuss the continuing existence of their second F1 team. It was an unusual project from the start, intended primarily as a way of keeping the popular Takuma Sato in F1 while the factory team got serious with a pair of highly-rated drivers. That Super Aguri met with some success was unexpected, no doubt, but quite pleasant for Honda while their primary effort brought them a win in Hungary in 2006. When the costs increased with SS United reneging on sponsorship payment, however, it became less attractive to have an extra team drawing money from the company. I suspect that Super Aguri will be lucky to survive the board's discussions over the winter. The usual answer to such a problem would be to sell the team to new owners and there has been some interest from prospective buyers during the summer. It is getting late for such a transfer to occur, however, and the problems associated with customer cars might hinder any sale. Presumably, any buyer would still have to run Honda chassis next year, either 2006 or 2007 versions, but this time without assistance from the factory. That cannot be an enticing prospect for a new owner, a two-year old car at the end of its development or a design that resisted all attempts to make it competitive. So it may be that the grid will be one more team short when it assembles again at the Australian GP in March next year. Is that a taste of the future for the sport - dwindling grids as the small teams are forced out? Even if it is just a blip on the graph, it is worrying that the field, so recently expected to comprise twelve teams in 2008, might instead have only ten. We may have hopes that other manufacturers could fill the gaps, VW/Audi perhaps, Hyundai and/or Nissan, but these are pipedreams as yet and unlikely at best. The message to the FIA and the remaining teams is that they need to sort out the mess regarding customer cars pretty quickly. There are teams in other formulae that would love to give F1 a go if their entrance were made a little easier. Now is the moment to address the problem, not next year or the year after when it may be too late. That would indeed be a shame if Suger Aguri did not compete next year. Everyone loves to see the underdog triumph, and despite being a huge Alonso fan, I was on my feet cheering when Taku overtook him ! It's times like that, which remind me of why I sit up until 2am every Sunday watching the race. Otherwise, it's a boring procession of the same guys winning, week in week out. I have long thought that the revenue generated from TV rights, ticket sales etc should be distributed far more evenly between the teams to enable smaller teams without manufacturer backing to be & stay in the sport. Although the outcry when Stoddart voiced that very opinion suggests that not all agree with that assessment. And absolutely, the customer car issue needs to be resolved, and quickly. But then, asking the FIA to get their act together - well - you might as well ask for the moon ! I agree that revenue should be distributed more evenly within the sport, Peril, especially as those who currently grab the most are the ones who need it least. Perhaps there should be a system whereby each team gets an equal amount merely for competing and then further funds are awarded according to position attained in the championship. Certainly, it seems extremely unfair to award nothing to the team that finishes last, usually a new team learning the ropes and having the most difficulty finding sponsorship anyway. Well, i was about to start writing os this subject when i read Pink's comment, and saw he wrote my comment for me. To loose such a great team as Super Aguri would be a great loss for the sport. There's a team living up to the initial thought of F1-racing, making their way by making the best they can of the situation and at least trying to make their own car. And then it would also be a big loss to se Takuma and Anthony loose their places on the track. I don't know that much about Anthony, but Taku is really one of the top drivers on the grid, who would produce great results if he were in a better team. Yes, I have a lot of time for Takuma as well. He may be a bit unpredictable but he's always entertaining. And, disregarding his driving skills, I'm told he's one of the nicest guys on the grid. Alianora confirms that, so it must be so! This is stupid. What happened to "stand by your team"?!? I mean, if we're going to have customer teams, doesn't that imply a certain amount of support from the organisation that spawned the customer team? This is a really bad way of confusing the issue. Super Aguri deserves to be on the grid - the quality of the people has demonstrated that much - it's only a question of sorting their car out. And maybe if they were given enough money they could make their own car. Besides, I'm sure Super Aguri's performance went down very well in Japan and helped cement popular support for Honda's own presence in F1. My two pence worth...........the distribution of monies is always an issue and I'd not argue that an INVERSE distribution might help. Divide the total season reveue in to 68 shares and then disburse 11 shares to 11th, 10 shares to 10th , 5 shares to 5th, etc. The teams that need the most help GET the most (financial) help. It's not a perfect system but far better than Ferrari and McLaren (who don't need the help) getting the lion's share! Concerning drivers..... there are rumors out this morning that some no-name rookie is "in the running" for Davidson's seat. That's the last thing Super Aguri needs is more changes. Sato and Davidson have been together since the B.A.R.-Honda days, they work together and what Super Aguri needs is a CAR, not a different driver in the old car. Ironically, Davidson is every bit a match for Sato, but he was three times 'taken out' by crashes not of his doing and a pesky marrmot at Montreal. Sadly DNFs count on one record, but after investing two years in him what's gained by throwing that all away and starting anew with an outright ROOKIE? Again I say, Where is common sense? Damn, I sure hope these guys can hang on for a few more years. Definitely one of the sentimental favorites on the grid, an underdog that every now and then can sneak up and embarrass one of the front-runners. And you have to admire Aguri Suzuki's audacity for not only naming the team after himself, but calling it "Super". Imagine Frank calling his team "Super Williams", lol. Taku is indeed one of the nicest drivers on the grid ! Owing to some shameless groupie behaviour, Mr Pink & I managed to bag all 22 drivers autographs at this years Melbourne GP. And Taku is always good for a crash or two, or a controversial move just to spice things up a little. It'd be a shame to see him & SA go. Alianora: Rants are always welcome. After all, I do a fair bit of that myself! As for SA being a customer car team, they can't be or they'd be illegal, wouldn't they? I don't know their reasoning for being something else but I presume they must have a good story ready for arbitration. But you're right - Honda has had a fair bit of good publicity from the team and it helps to offset the mess the factory team made of their car this year. Certainly, SA deserve to survive. Number 38: The problem with prize money being awarded in inverse order to finishing order is that it's like rewarding poor performances. I think a flat amount for participating and then prize money on top of that would be best. It still rewards the teams that achieve more but not as disproportionately as at present. As for the drivers, I can only agree. Peril: Agreed, I like Taku and would be sorry to see him and the team go. In the Far East (and Africa), it's quite common to give a company aspirational attributes, whether that's in the name or somewhere else prominent. I can't see BMW being re-named "Super Mario" in the near future though, can you?